Maybe the Flyke is for you! The goal was the ultimate "Toy" for PPG. You can fly and bicycle! If you are on the ground, the motor and glider can be stowed and the whole thing pedaled, to the gas station or home, for instance. The bicycle can be used with the motor running on the ground up to 40 mph (tested) with two hydraulic brakes stop the unit. The Flyke launches like a regular trike. It offers a comfortable seating position and unobstructed view and great ergonomics. No special harness is necessary, sit down, fasten your seatbelt and take off. The bicycle is front wheel drive and steers with articulation. The whole front of the Flyke - the bicycle/seat assembly - pivots into turns. On the ground a steering handle is used. On take off, the hands are on the brakes, so the Flyke is steered automatically by the glider. If the glider pulls to one side, the steering automatically follows. During take off, the pilot only steers the glider, not the bicycle. The engine can be dismounted in seconds and used as a back pack. While bicycling, the flyke is faster than a regular bike, proven during many tours. The weight is 21 kg (45 lb). The low drag, high quality bearings and high pressure tires compensate for the extra weight and 3d wheel. The suspension travels 10 cm and the jettison test necessary for german certification have been successfully completed. The concept is fun: After landing, you can pedal to the gas station, refuel, stop at a friends house, fly home, whatever. You are now mobile with all your gear and not tied to your field. 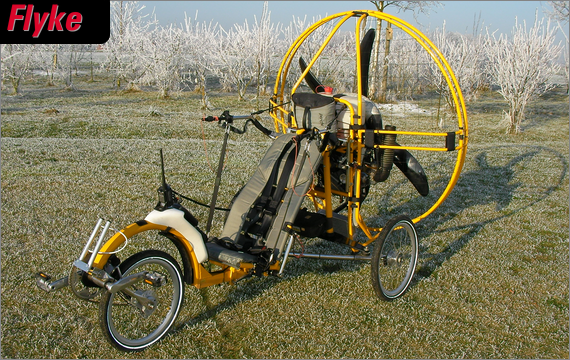 The Flyke does not include the paramotor, the best motors for use with this trike are the Simonini and Monster Hirth. Bonnie - Beautiful story about how you ended up where you are today! It was so raw and real I started to tear up just rianedg it. Although I think you would have done great in public health (I'm biased , I think you are an amazing photographer and people like us are lucky to have people like you! Rock on Kim! Click the button below to add the Fresh Breeze Flyke to your wish list.